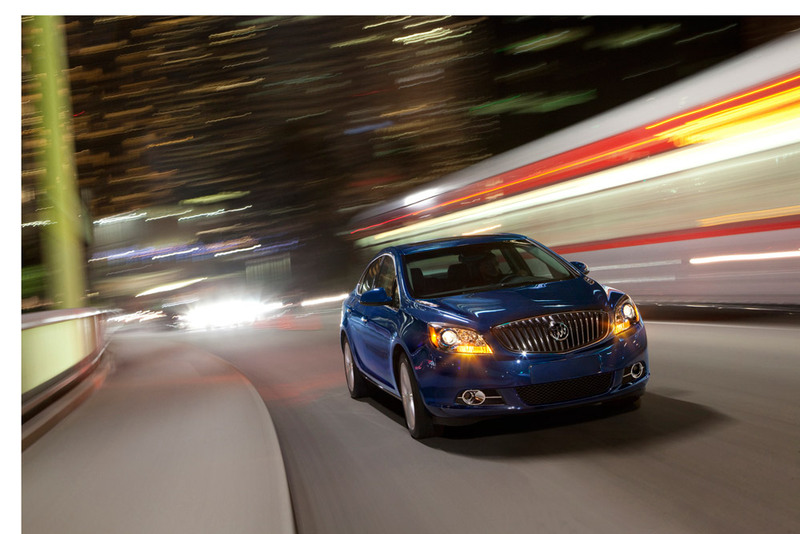 The 2014 Buick Verano is all about safety, including forward-collision and lane-departure warning systems, this model year. Passengers in the front seats will also be a bit warmer with standard heated front seats, except in the base model. While the exterior is a bit more sedate than the majority of the Buick’s other models, the 2014 Buick Verano defines the word “reserved”. The large grille with the well-known tri-shield exemplifies the brand, making it known that the Verano will be the perfect entry-level luxury car for your family. With a standard 2.4-liter four-cylinder engine, the 2014 Verano isn’t exactly a powerhouse, but it has enough kick to get you where you’re going. If you’re looking for more horsepower than the 180 the standard engine gets, you can choose the turbocharged 2.0-liter four-cylinder that boosts 250 horsepower. Whether a manual or automatic transmission is for you, there’s no going wrong with the Verano’s fuel efficiency—either way you’ll get 25 mpg combined for the standard 2.4-liter four-cylinder or 24 mpg combined for the turbocharged 2.0-liter four-cylinder. Normally, when you hear the word “compact” in a car’s description, you don’t expect the interior to be very roomy—until you see the inside of the 2014 Buick Verano. While it’s not up to par with a midsize sedan—it’s a compact car after all—every driver will find enough room to make him- or herself comfortable. This roominess combined with a sleek dashboard layout presents a touch of luxury to the compact segment, connecting passengers with Buick’s IntelliLink infotainment and integrating Pandora and Stitcher radio apps. With four different trims—Verano, Verano with Convenience Group, Verano with the Leather Group, or Verano with the Premium Group—you can choose just how much luxury you want. The 2014 Buick Verano is a top-notch student in the school of safety, receiving a top overall government crash test rating and the highest possible rating of “Good” from the Insurance Institute for Highway Safety. It includes a standard OnStar system, which utilizes safety features such as automatic crash notification, on-demand roadside assistance, an emergency button, stolen vehicle locator, and active intervention. Five Star Chevrolet Located in Warner Robins Georgia, Five Star Chevrolet serves Macon, Albany, Savannah, and Atlanta. Our large inventory of new cars from Chevrolet, Buick, GMC, and Cadillac covers all of the most popular models, including the Chevrolet Silverado, the Chevrolet Malibu, the GMC Sierra and the Chevy Cruze. We also have a wide range of used cars, covering many popular makes and models.